henna floral, a photo by Henna Trails on Flickr. It was Tuesday night, a night reserved for myself and my henna cone. Often, when this day comes I really have no idea what style of henna to create with. 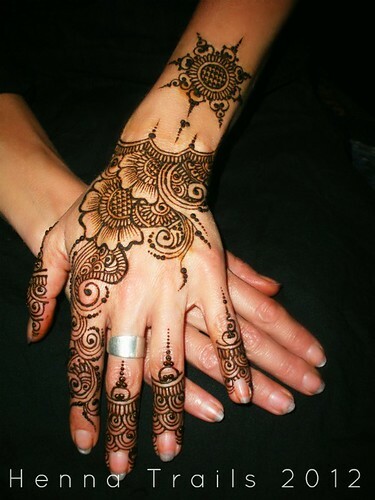 I see so very many henna design photos in the course of the week, it can get rather crowded in my mind! There are so very many styles I love. I could go on and on discussing such things, ask my family! However, yesterday I came across a portfolio that spoke to me artistically. The artist is based in the Trinidad area and her work is a fine delicate balance between naturalistic floral and lots of details I associate with Indian styled work. Her work uses lots of negative space, something I can relate to! I am always looking for those designs which are not just for brides, something for those of us who simply like henna as a part of natural beautification. I was inspired by the portfolio of AneesaKarim.com. She also has a facebook fan page. Thats a really nice design, very precise and crisp! I just discovered you blog and love it. I look forwad to seeing you at My Dream Canvas. Thank you, I did use some spectacles for the details! I often feel that my paste has everything to do with my line work, I am loving my new henna powder it is so silky! Oh ya i totally agree… henna paste texture is very imp….